The MEZZ-Series Galvanized Steel Roof Hatch is manufactured from galvanized steel to ensure years of dependable use, even in most extreme weather conditions. 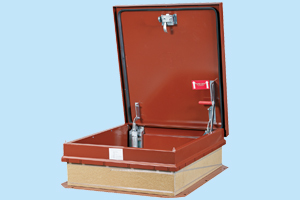 The lids are mounted on a 12" curb with cap flashing to ensure against leakage. These metal hatches come standard with compression springs, zinc plated steel hardware, and insulation in the cover and at the curb perimeter. 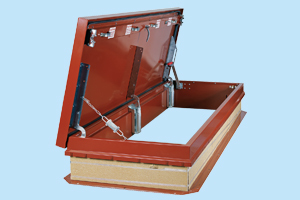 The MEZZ-Series Galvanized steel roof access hatches come in red oxide powder coating for additional protection. Galvanized roof hatches offer cost savings over the more expensive aluminum options. 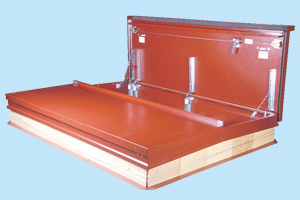 For information on a roof hatch or roof hatch ladder package, please use the form on this page. All MEZZ-Series hatches have the following available options: custom roof hatch sizes, stainless steel hardware, pitch corrected roof hatch curbs, curb mounted options for mounting to existing roof curb, double wall roof hatch curbs for concrete mount, taller roof hatch curbs for special applications, thicker insulation for roof hatch curbs, hurricane strength version for Miami-Dade county applications, Security series available for banks, prisons etc.. If there is a custom need you have that is not listed here please give us a call. Insulation: 1" thick rigid fiberglass in cover and 1" at curb perimeterMounting Flange: 3½"